It looks like one person managed to dodge fairground staff as well as other bumper cars, when he was spotted casually driving one of the fairground vehicles on a public road. 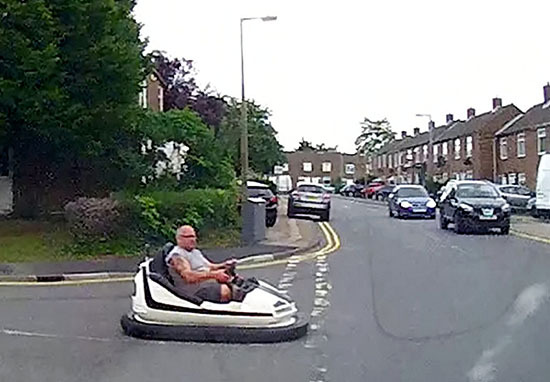 One driver became very confused when he approached the runaway dodgem on a housing estate in Harlow, Essex, as the small white vehicle pulled up to a junction in the road they were approaching. 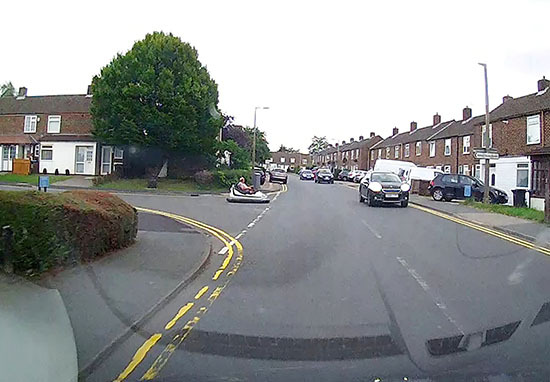 The bumper car was caught on a dash cam by the baffled driver, who was probably very glad the person behind the wheel of the little car was abiding by the rules of the regular road, rather than those of the traditional fairground ride. 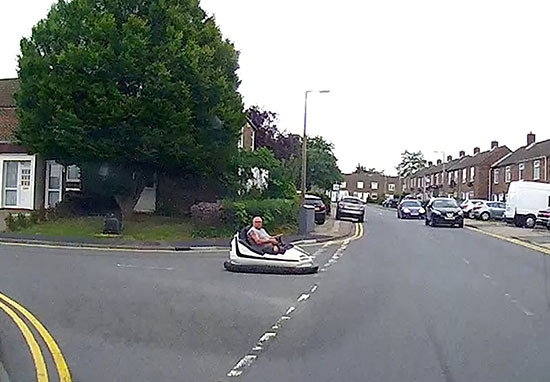 The driver of the dodgem is currently unknown, but he sporting a vest – so was probably cold as he waited patiently at the junction, as if his choice of vehicle was entirely natural. The footage was captured at around 6pm last Wednesday (September 19). Maybe the driver was on the hunt for a burger and some fried doughnuts for his dinner in keeping with the fairground theme? The dash cam was on a vehicle which belonged to HD Property Services, but the camera was supplied by Telematics Pro UK Ltd.
Ben Peters, who runs Telematics Pro UK Ltd, described his reaction when he first saw the unbelievable clip. I just thought oh my god, is that really a dodgem? I know that electronic cars are popular, but this is another level. I can only assume that he has amended it to make it into a road legal vehicle. I have never seen anything like it before in my life. It’d be interesting to see how many miles he gets on the dodgem, though it doesn’t look like it would be very comfortable in the rain. He should trick it out with one of those waterproof covers you can get for electric scooters. According to the Mirror, Ben went on to explain the driver of the car with the dash cam, was so shocked when he came across the fairground ride, he pushed the panic button. We install the panic button with the dashcam and manage the system. Usually this is pressed in an emergency so we respond immediately to ensure the safety of the driver and to manage the emergency. Initially we thought it was quite a serious accident but it turned out to be just an hilarious video. I wonder if you get to play on the fairground dodgems for free if you bring your own vehicle? If so, it could be an excellent investment for dodgem enthusiasts.